Known most commonly as the Washington Street Boat Landing, this pergola structure was designed by Daniel Huntington and dates from 1920. It served as a harbor entrance for boats bringing passengers from larger ships and also as a waiting shelter. It is included in the City of Seattle’s Pioneer Square Historic District, but not in the National Register of Historic Places version of the Pioneer Square Historic District. It remains the only important landmark in the Pioneer Square Historic District on the western side of Alaskan Way and in previous nominations, has the latest date of any of the buildings or structures considered to contribute to the city district. Daniel Riggs Huntington was also the architect, with James Schack, of the Morrison Hotel, completed in 1909. Huntington was born in 1871 in Newark, New Jersey and educated at Columbia Grammar School and Columbia University. He began his architectural career in Denver, Colorado in 1889 and worked in New York for about six years beginning in 1894, only to return again to Denver. He arrived in Seattle in 1904 or 1905 and by 1907, had formed the Schack and Huntington Partnership. Later highlights of Huntington’s career include the 1912 design for Seattle’s Colman Dock, a two year partnership with architect Arthur Loveless. It was during his time as Seattle City Architect from 1912 until late 1921 that he designed the Washington Street Boat Landing. One of the early products of his work as City Architect was the Lake Union Steam Plant in Seattle. He taught briefly at the University of Washington (1923-24) and continued an independent architectural practice at least until the Depression. From 1944 to 1946, he was also employed as an architect for Washington State University. He died in 1962. The Washington Street Boat Landing was restored by the Committee of 33, a local Seattle philanthropic organization in the 1970s. It is also supposed to have been one of the inspirations for Ilze Jones’ modern pergola, (Jones & Jones Architects, Landscape Architects), in Occidental Park. 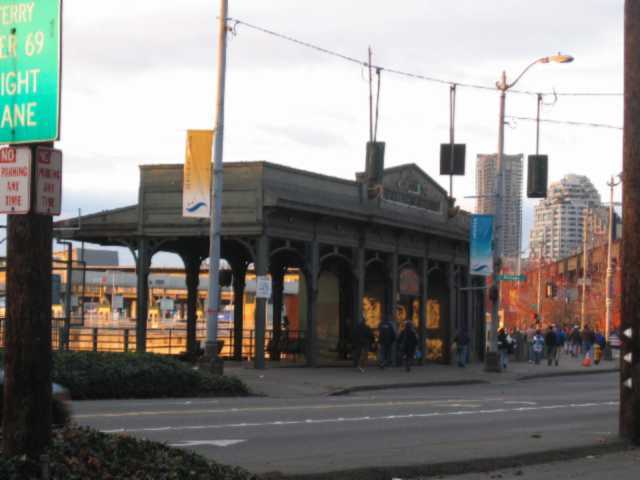 This is an iron and steel pergola, partially open to the elements and located between Alaskan Way and the water, at the end of Washington Street. It is distinguished by the raised crest at the roof level along Alaskan Way and the combination of utilitarian structural members combined with delicate ornamental shapes. These include repeated supporting I-beam columns with thin arched truss forms in metal and large, delicate braces with curved shapes, which are riveted into the vertical elements, as well as small ornamental console brackets. Steinbrueck, Victor, “Pioneer Square Historic District – Seattle Register of Historic Places,” Handwritten draft, ca. 1969 – undated ( University of Washington, Manuscripts and Special Collections).